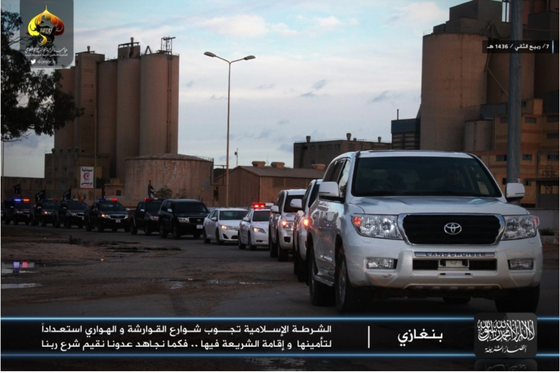 Ansar al Sharia Libya, an al Qaeda-linked terrorist group, released a series of pictures in late January that are intended to highlight its governance efforts near Benghazi. The organization gained international infamy after the Sept. 11, 2012 terrorist attacks on the US Mission and Annex in the city. Ansar al Sharia fighters from both Benghazi and Derna participated in the raids, which left four Americans, including Ambassador Christopher Stevens, dead. 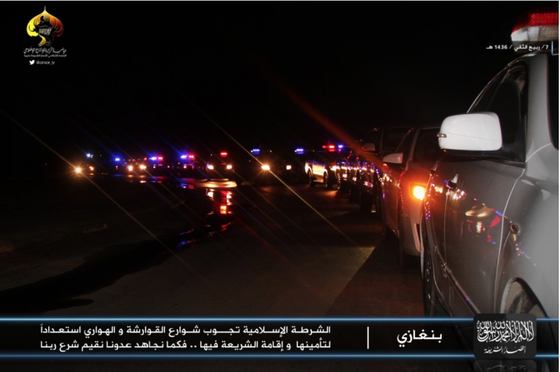 The propaganda photos were posted on a Twitter feed maintained by Ansar al Sharia’s media arm, Al Raya Media. That feed was subsequently suspended by Twitter. The group has been locked in a fierce battle with forces loyal to General Khalifa Haftar since last year. 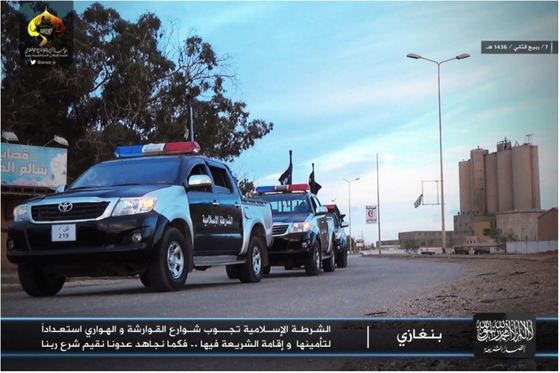 Ansar al Sharia Libya leads the Benghazi Revolutionaries Shura Council (BRSC), an alliance of jihadist groups seeking to control Benghazi. Ansar al Sharia recently confirmed that its leader, Mohamed al Zahawi, had succumbed to wounds he sustained during an airstrike late last year. Zahawi’s death had been rumored for months, but there was no confirmation until his family, and subsequently Ansar al Sharia itself, confirmed it. The photos are undoubtedly intended to project power and influence in and around Benghazi at a time when the group is battling for control of the city and its suburbs. General Haftar’s forces similarly claim to control most of Benghazi and the surrounding neighborhoods. According to multiple reports, the city of Benghazi has suffered extensive damage during the fighting between the jihadists and Haftar’s men. A flag commonly associated with the Islamic State, which claims to rule as a caliphate over parts of Iraq and Syria, can be seen in photos of a building under the group’s control. 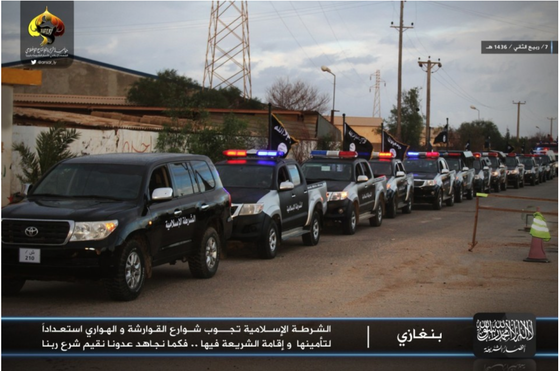 A number of Ansar al Sharia vehicles are shown flying the same flag. 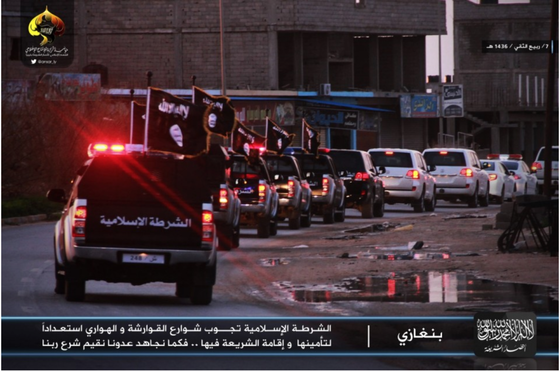 However, this does not mean that the group has sworn allegiance to the Islamic State. 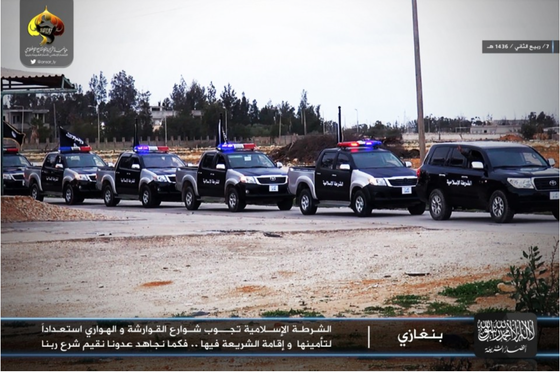 The same images show a black banner typically associated with the Al Nusrah Front, an official branch of al Qaeda in Syria, and al Qaeda in the lower right hand corner. The same type of flag was adopted by a number of organizations prior to the rivalry between the Islamic State and al Qaeda. 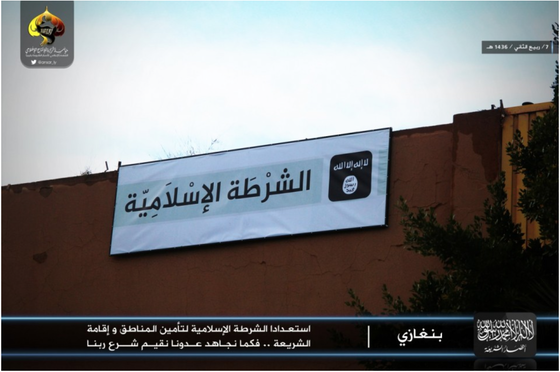 In addition, a number of groups loyal to al Qaeda have used the same type of banner. 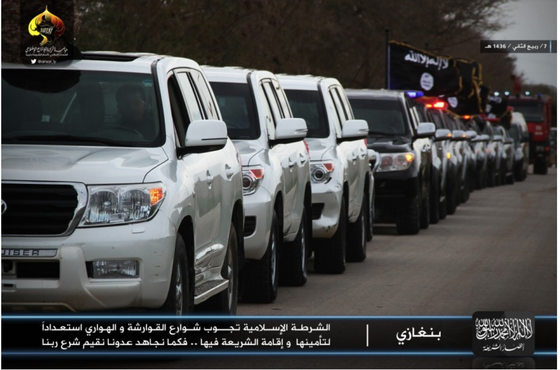 Still, there are rumors on social media that some Ansar al Sharia’s followers have defected to the Islamic State. 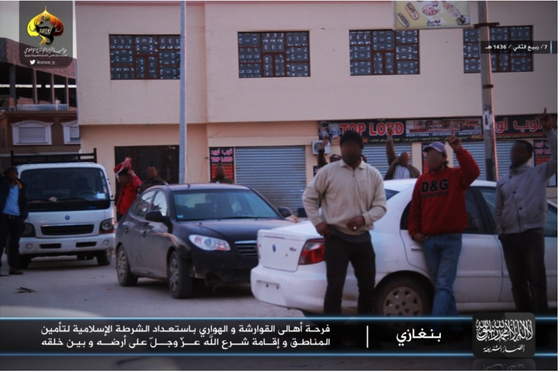 The pictures, reproduced below, show a building that allegedly serves as a police headquarters for Ansar al Sharia. 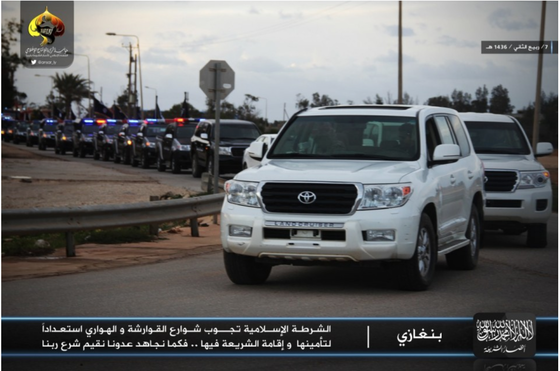 Several photos show vehicles belonging to the group’s security personnel, who seek to enforce their radical version of sharia law in and around Benghazi, as well as elsewhere in Libya.